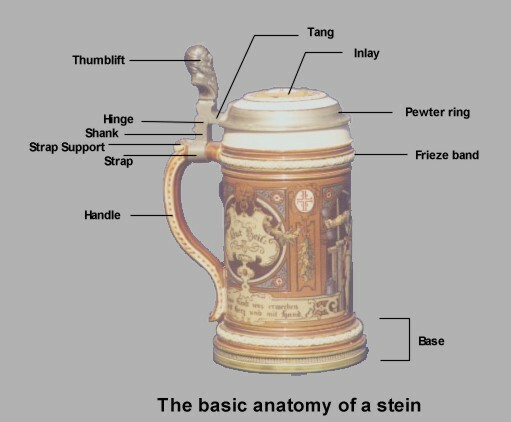 The figure above illustrates the basic terminology which has been widely adopted by stein collectors. Some of these terms are obvious, while others, especially the terms for the elements of the pewter fittings, are specialized. The following points supplement the illustration. Inlaid lid - A lid which is comprised of a decorative piece of ceramic or glass which is contained within a pewter ring which in turn is part of the overall lid mounting. The inlaid portion is normally referred to as the "inlay". Hinge - While the pewter hinge rotates like a standard furniture hinge and gives the appearance of being made with a pin, in fact the so-called hinge-pin is actually formed in combination with the inner hinge rings as a single piece of pewter. Any attempt to "knock out" the hinge pin in order to work on the lid will result in damage to the hinge. Thumblift - Thumblifts were intended to provide a means to lift the lid of a stein in order to drink.